Welcome back to Tech Tools, and thanks to those of you who read and tool the poll after last issue’s inaugural offering! As you can see, only five people voted, which is not a great response rate, but the five of you who did respond seem to like, or at least sort of like, the column format. So, without further ado, I present to you this month’s column! Does it ever seem as if managing your to do list (or lists!) takes on a life of its own? It does to me, and I am always on the lookout for ways to stop focusing on what I need to get done and start just getting it done. There’s an app for this, right? I’m kidding. But still, there must be an app that will make it easier, right? Of course, answering this question is a project in itself. A Google search for “time management tools” turns up an overwhelming number of opinions and online tools that that promise to improve my life via improved efficiency. Upon discovering a promising tool, the process of testing is time consuming, and implementing even more so. Knowing that I am not unique in this time and task management conundrum, I have compiled my research observations regarding three to do list products for this issue’s Tech Tools. I chose to focus on just to-do list tools. While the products below offer bells and whistles of various sorts, I left the heavy duty project management and task tracking systems for another time. These tools are also all freebies. Though a premium version is available for each of the product below, my review will focus on the free version. Finally, all of these bad boys can be used on the Web and both Android and iOS mobile devices (iPhones and iPads) at a minimum. Todoist is a great to-do list and task manager with little learning curve and is available on the Web with Android and iOS apps. If you are a tinkerer, Todoist also offers an impressive list of plug-ins and extensions to explore. Once you’re set up, create tasks and organize them into projects. Assign a time (single or repeating) and a priority level from 1-4 to each task. Project lists can also be created as secondary (or tertiary, and so forth) to other projects. Todoist start page example. This is the Web version, but the apps are very similar. My start page defaults to tasks due in the next 7 days. View only the tasks assigned to a project using the menu on the left side of the screen. Add a task by choosing the project list from the left menu (in this case, “not work”). For tasks with dates, type in a date or use the popup menu shown here. Clicking on the small network icon (shown enlarged to the left) above the task edit data window will give you the option of sharing or assigning tasks via email. The same is true of projects. Pros: Todoist has a low learning curve with a well designed, visually pleasing interface. Even the Android and iPad apps don’t require decrypting an elegant but meaningless icon set. Does one thing (organize to do items) very well. Cons: Adding reminders or notes to a task item are premium features. I cannot blame the developers for this, and at $29/year, the product is not overpriced by any means, but it is a consideration. Recommended for: Individuals who want or need to break activities down into their individual components and keep them organized but don’t necessarily need their phone or computer to remind them to do things (unless, of course, you choose to pay for a premium account). Any.do is a beautifully designed task management app that is so streamlined that at first glance it’s hard to believe it does anything, when in fact it is quite busy at work for you. Though Any.do can be accessed via the Web, I recommend downloading one of the mobile apps first if you wish to try this product. This is not to say that the Web interface is bad, just that the app really shines when used on its home turf. The Any.do app as displayed on my Android phone. This is the list view. There are two view options in Any.do, the “list view” (shown to the left) and the “date view.” Both views are very simple, with little detail to clutter the screen. Add a task using the box at the top of the screen or next to the lists themselves (which will auto add the task to that list). Tasks can be added by typing (or “Swyping”) into the box next to a + sign or choose the microphone icon and talk, presuming that you have a device which will support this option. I didn’t think I would like this way of adding tasks, but I found that it is one of my favorite features. After adding a task, select it to see and/or add more detail (see the screenshot above). These are the sort of cryptic icons that I mentioned Todoist not using, and while I enjoy the elegant design, I prefer a bit more context. However, I could identify five of the seven without clicking on them. Most of the options are useful but not unusual – there are icons to prioritize; set a reminder time and frequency; add sub-tasks; email; and move a task into one of your lists. One feature that is unique to the others in this group is the option to add a note that includes an attachment which will display with the task. This is demonstrated below. Add a note, an image, or a file to your task. Any’do’s signature is the “Any.do moment,” which is a time each day (selected by you) upon which the app will remind you to “take a moment to plan your day” and displays a screen that shows the tasks that you have asked to be reminded of. Those who use Any.do’s sister calendaring app, Cal, will also see their daily agenda. Pros: Any.do has created a very efficient way to enter and view to do items when using limited screen space. A free account includes all of the important functionality, while a paid account (currently $27/year) adds some bells and whistles such as location-based reminders (I am imagining “oh look, Albertsons! Pick up pasta!”). Cons: This app is designed to be a virtual personal assistant, integrating one’s daily agenda into one gently nudging subordinate who knocks quietly to remind you that the boss is coming by at 4:30 and arrives with a martini just as you need one. This is tempting, but just not how I work. I want more control over my boundaries. For example, if I’m at work, I want to see my work to-do list exclusively, and will set an alarm if I have a pressing personal task or engagement to attend to. That said, this is a great tool, and I think that maybe some of you will love it. I hope so, it’s from a good family. Recommended for: Individuals who want to add an item to their task list and not think about it again until it’s due, or those who always forget to pick up the pasta and really could use that nudge when they are near Albertsons. Remember the Milk (RTM to those in the know) is a handy little to do list app with a solid Web interface and apps for iOS, Android, and Blackberry. It’s been around since 2004, long before our phones thought they were smarter than we are, and is known for solid functionality without the glitz and glam. The Web interface for RTM isn’t fancy, but it gets the job done. RTM is based on lists, which display as tabs. After adding a task, select it to add or review the associated information. Enter choices in natural language – for example, to repeat a task daily, type “daily” or “every day.” Other actions can be applied by checking the box next to one or more tasks and choosing “complete,” “postpone,” or one of the many other choices listed in the popup menu. Detail of the “more actions” popup menu. 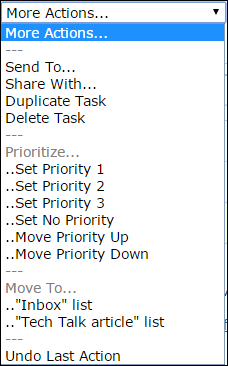 The priority options are useful when sorting tasks. Detailed view of the task data box. Notable alongside the usual suspects are the time estimate field and information about the number of times a task has been postponed. Pros: Like Todoist, RTM lets you review your task lists individually or together, but RTM allows one to sort by priority, due date, or title of task within each of these views, which is helpful when managing more than one project or aspect of life. Cons: Like Todoist, reminder notifications are reserved for paid subscribers (a pro account is currently on offer for $24.99/year). In addition, though the iOS and Android apps are free, synching is limited to once every 24-hours for those with free accounts. Recommended for: Individuals who prefer to manage tasks on a computer and like to be able to focus on one project at a time while also being able to review due dates in one list. Those who rely heavily on mobile access or would like regular reminders may be better off with a pro account or another tool. You may be wondering which choice I made. My top choice is Todoist, but in truth, I continue to use Google Tasks, because it integrates with Google Calendar, which is the the chosen calendaring system for Boise State University. Because I can see my tasks in the “all day” are of my daily agenda, I’m able to get a sense of my ability to fit them into a given day or week, and thus to keep most of my balls in the air most of the time. Google tasks displays to do items with dates at the top of each days agenda. On the right side is the popup window that displays when you click in the “All day” portion of that day’s screen and choose “task” (the default is “event”). However, Google Tasks has some limitations. You can only view one list at a time, which effectively defaults me to using only one list for everything because otherwise I lose the benefit of reviewing all of them synchronously with my calendar. In addition, repeating tasks and prioritization is not supported and Google has not developed an app or fully functional mobile version of Tasks (I find Google Tasks Canvas to be barely useful). However, for those who do not mind the basic simplicity of the Google Tasks model, but require mobile access, there are third party apps which synch with Tasks – I use GTasks, available for Android devices. There are, of course, many more options for those in search of the perfect solution. Four that have caught my eye but didn’t make the cut for this column (mainly due to the fact that they are more than to do lists and deserve more attention) are Wunderlist, TickTick, Toodledo, and Evernote. If you’ve used one of these (or something else) and have comments about them, please feel free to comment! I’d love to get a conversation started about how those of us in libraries manage to manage our lives. I have always had an affinity for the useful. When we learned origami in grade school, I was the one making little boxes, one of which I believe my father still uses to store paper clips on his desk. I suspect that many in the library profession feel the same way. And so I am happy to announce The Idaho Librarian’s new Tech Tools column, which is devoted to informal discussion of practical technologies and their application to a library setting. I hope that you’ll join the conversation by adding your own ideas, questions, tips, and experiences as comments; by letting me know what you want to know more about (and what you don’t); and perhaps even by guest authoring. And so, without further ado, welcome! Whether it’s a budget report, results of a survey, or trends in reference desk statistics, data is often better received when it’s presented in graphical form. Numbers come to life, trends can be clearly visualized, and survey results are shown with context. Even processes and ideas sometimes lend themselves to pictures, and of course no librarian is complete without the ability to generate an occasional Venn diagram! [nb. I’m totally kidding – most of us would survive]. The term “infographic” is defined by the Oxford English Dictionary as “a visual image such as a chart or diagram used to represent information or data in an easily understandable form.”1 That definition encompasses a number of everyday objects such as maps and the instructions that come with Ikea furniture. To me, though, the word implies a certain amount of flair – more than a lone graph sitting on a spreadsheet or a diagram showing which screw to put in which hole. Since I can’t cover them all, I’ve chosen two of my favorite general purpose, online infographics tools (which is to say, no download is required), both of which are easy to use, so that you can get in, get out, and get on with your job! Both of these tools allow you to sign up for a free account or you can sign in with Facebook or Google account. Easel.ly has one of those silly names with a dot in it, but I’ll forgive that because this is a great tool for creating infographics. In fact, it’s so great that it won an American Association of School Librarians Best Websites for Teaching and Learning award in 2013. Easel.ly is completely free, and is not just a toolkit, but also a site where creator’s infographic are posted. These examples be used for inspiration or as templates (aka vhemes). Just a few of these are shown in the screenshot below. Though it’s fastest to use a vheme, you can also start from scratch. Menu choices are selected by dragging and dropping an item on to your work area. The screenshot (above) shows the menu options for background colors and patterns. Below you’ll see the lovely beige reptilian print that I’ve chosen for my new infographic, along with menu options for objects in the “music” category. On the left side of the screenshot a popup menu lists the other object menus. In addition to a plethora of background, object, shape, and text choices, images can be uploaded and used as objects. Once completed, save your Infographic project, then click the ‘share’ link to get a custom URL or download your project as a jpeg file. In addition, your projects can be set to private or public. So you can use your creations in anyway that you please, we don’t restrict you in anyway. We do always like our users spread the word about our tool so that we can continue to grow. After a few minutes of fumbling around, I found Easel.ly to be both intuitive and feature-rich enough to be fun and functional. The main limitation is that it’s not set up to manage data sets, so any charts or other representations of data have to be added in as graphical elements. This is no problem for static data that is relatively simple to demonstrate. In addition, the canvas size cannot be increased, so larger infographics will best be managed elsewhere. Piktochart is, like many free online tools, also available in a pro version for a fee ($39.99 a year for students and educators). I’ll cover the free version, with a few notes about the pro version. Like Easel.ly, Piktochart’s main page displays a pleasing array of themes, which are templates to use as starting points. However, unlike Easel.ly, most of the awesome themes in Piktochart are only available to pro users. Still, there are a few themes available to free users, and they’re helpful for beginners. In the image below, I’ve used a theme called “Minimalist Presentation” as a starting point. It is also possible to begin with a blank slate, but I recommend trying out a template first unless you’ve used similar tools. Piktochart is based on “chunks,” each of which represents a content area. Upon clicking on a “chunk,” a popup window offers canvas size and placement options, shown above in the center left. In addition, chunks can be resized and moved using your mouse to drag them. In this regard, Piktochart offers some creative flexibility over Easel.ly, since not only can chunks be resized or added, they can vary in background color or image. Other elements such as text, graphics, charts, and maps are added to chunks by selecting them from menus. Like Easel.ly, each menu provides a number of options (and another invitation to “go pro” and retrieve more). In addition, a separate menu across the top of the screen offers file choices such as “undo,” “redo,” and “delete.” Below, the menus are shown along with some of the options for background. Where Piktograph really shines is in the ability to add data and have it display within your graphic. To do this, select “tools” from the menu and either add data to the spreadsheet that pops up or import data from a file on your computer. In addition, Piktochart offers a dynamic data option, but I am not that into data, so if you need to use this option, you’ll need to look elsewhere for insight. Below I’ve created a simple spreadsheet with a doughnut chart. Along the left side of the chart area you will see other chart types, which you can click on to see how your data looks in a variety of representations. Additionally, colors and other look and feel options are available in the “settings” menu. Below is the same data represented in an icon matrix made of hearts. You’re welcome. When you’re done with your customizations, save and choose a sharing method (image download, web, or email) and you’re on your way! Below you can see the Infographic that I created for this demo in whole. Though I had not (at the time of this writing), hear back from Piktograph asking for clarification of any copyright restrictions that they place on work produced using their software, note that the free version of Piktograph does insert a small attribution at the bottom. It is my assumption that the company would like the attribution to remain in place for the free version of their software – in my view, a small price to pay for free. At any rate, I once again recommend reviewing the Terms and Conditions information. While Piktochart has some additional features which add a level of complexity, I found the menus to be very usable. I prefer selecting items by clicking instead rather than dragging and found the prominent edit icons along the top to be a handy feature. In terms of creative flexibility, Piktograph offers some features that Easel.ly does not, but the free version does not come with the range of built in themes or objects. I love Easel.ly and Piktograph equally, and for different reasons. Easel.ly is free, robust, and super easy, plus they have great support. There are hundreds (thousands?) of themes that can be used as starting points, and it comes with a full set of icons and other objects. Overall, it’s a great tool if you’re seeking an quick and easy way to demonstrate fairly straightforward information visually. I recommend Piktograph for tech-comfy users who want the added flexibility of a chunked canvas and/or who prefer to add data in a spreadsheet format – and who aren’t put off by the attribution. For those who have reason to create infographics regularly, the pro version appears to be well worth $40/year. So . . . what did you think? 1. “info-, comb. form.” OED Online. 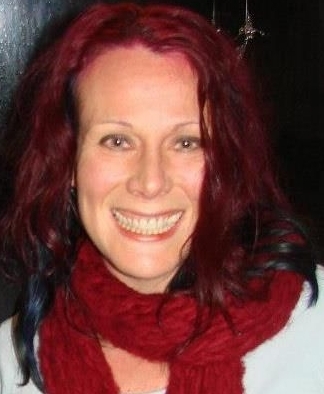 Oxford University Press, March 2014. Web. 6 May 2014.